Comments: The grotto salamander is sometimes called the “ghost lizard” of Ozark caves. This amphibian has two life stages. The 2-3 year larval stage has gills, tailfins and functional eyes. It forages in spring-fed streams outside of caves. The immature salamander has flecks of yellow on a purplish-gray body. The adult stage doesn’t have gills, tail fins or coloration and resides deep inside caves. Eyesight is of no value deep inside caverns and the eyes of the larval stage are no longer functional in adults. These vestigial eyes appear as dark spots with fused or partially fused eyelids. The adult hunts blind crustaceans and other invertebrates that are detected by its sensitive skin. 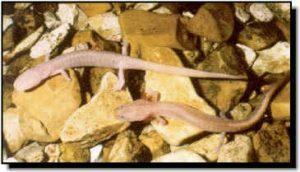 The grotto salamander only occurs in Kansas in Cherokee County in or near cave habitats.